A couple of weeks ago, Untius Seed Fund held an event for all of our Venture Advisors and Portfolio Companies. 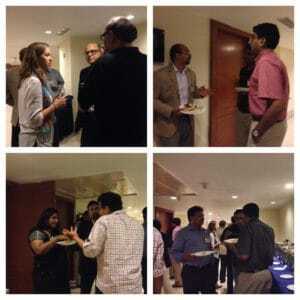 Everyone who could make it gathered in Bangalore for good conversations and good food. Each of our portfolio companies were asked to speak about why they started their business, what the next 12 months look like and what their biggest struggles are. On the spot we asked all attendees to raise their hands if they thought they could help out with any of these pain points. Our team was blown away by the eagerness of everyone in the room to lend a hand. Great ideas and connections were flowing and it clearly demonstrated what a valuable community we’ve created in the short time we’ve been around. Our fund invests in very early-stage companies. We see great potential in all of our portfolio companies even before they’ve gotten a lot of traction. One our core strategies is to help our companies be successful by providing specialized and experienced support from people they would not have access to otherwise. We do this both through our investing team who has deep operational background, and through our knowledgeable community. Our growing group of 30 Venture Advisors are all experts in their field and are always willing to mentor or connect our companies. In addition, we’re building a network of service providers to provide our companies easy access to affordable and high quality attorneys, finance professionals, marketers, HR experts, and others. We’re excited to continue to grow this engaged community. It’s gratifying and humbling to bring such capable people together around really great enterprises and seeing the beginnings of what we know will be extraordinary outcomes. Unitus Ventures (formerly Unitus Seed Fund) is always looking for new qualified Venture Advisors and service providers. If you’re interested, please send us a message.